If you haven’t been checking on Spoon’s website over the past three years or so, you missed out on quite a few outtakes. 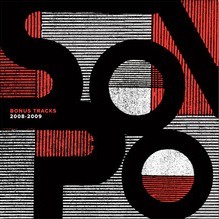 Well, Spoon felt bad about that, but not that bad as they are now selling those tracks on a CD or digital download as Spoon Bonus Tracks 2008-2009 (Tracks Below). Recommended for those who wish “You Got Your Cherry Bomb” had more country flava. Plus, everything is 10% off for the holidays, including that Spoon-branded prayer candle for those difficult to shop for devout hipsters. This entry was posted in New Albums, News on December 1, 2010 by Dave.